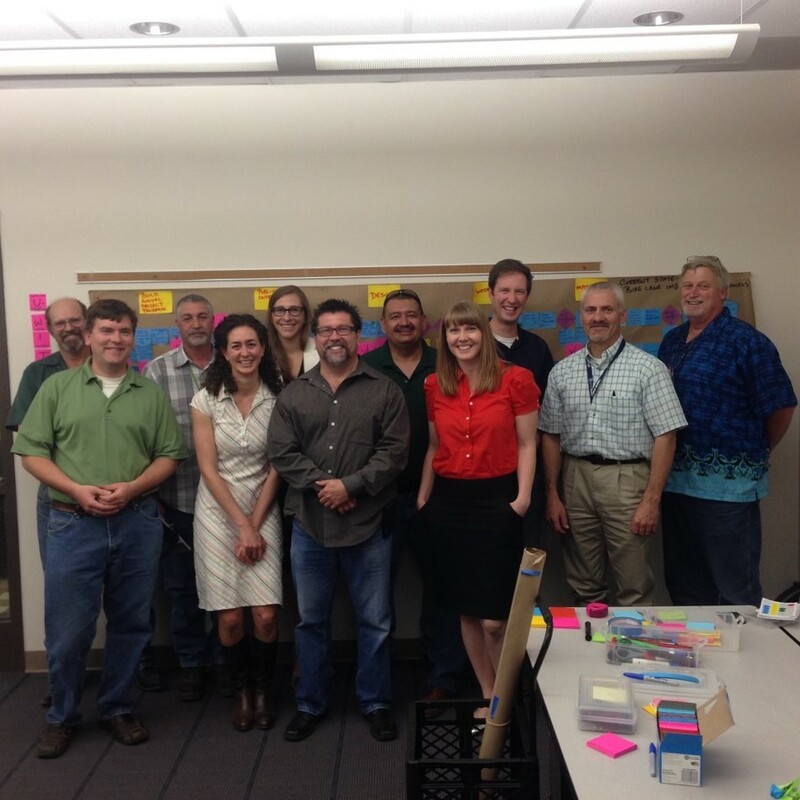 Pictured above is the very excited PWTM Bike Lane Implementation Process Team with their current state process map: Michael Koslow, Rachael Bronson, Dan Raine, Jeff Lancaster, Ron Smart, David Hermosillo, Kevin Olsen, Kurt Alge, Gerard Montoya & Brittany Price. Transforming an okay process into a great one does not happen overnight, it happens one spoke at at time. Just ask the Denver Public Works Transportation & Mobility (PWT&M) bike team – they have been cycling towards greatness, small innovation-by-small innovation, for roughly a year now and, although they are still not there, they are getting closer everyday. Turning an okay process into a great one that delivers more value to its customers without waste, requires planning, collaboration and collection of small innovations. Instead of seeing the pain of the process as too large, the team broke the the process and its defects down, spoke-by-spoke. Using several Peak Academy tools such as value-add analysis, process mapping, the eight-wastes and voice of the customer, the PWT&M bike team identified one third (22/66) of the bike lane implementation process as problematic and having no value to the customers of the process at all. Yet, in spite of these barriers and time pressures, the PWT&M bike team collaboratively developed twelve small innovations to simply and effectively reform and sustain the bike lane implementation process. By deciding to eliminate ten hours of wasteful processing by designating one crew to facilitate bike projects instead of multiple crews throughout the year, this innovation and a couple of others eliminated multiple process pain points, and are estimated to save the PWT&M bike team a total of $97,000 in hard and soft dollars by May of 2016. The lesson learned: a series of small but focused innovations can equal a huge improvement over time. When we break any problem down, piece-by-piece, we can better understand and solve for it. Today and tomorrow, spoke-by-spoke, there is no problem we cannot solve.